I'm here with a quick share today. I made this super quick gift card the other day with very few products. The stamp set is from Hampton Arts. I bought it years ago and forgot I even had it until we moved last year and found it. I love this little Santa. I made the card a tad smaller than normal. I used a 1 inch crease at the bottom of the card to fold up inside so I could put a gift card inside. I colored Santa with some Prisma colored pencils and used this die from Simon Say Stamp. 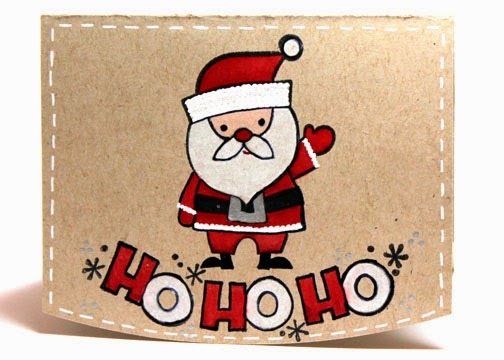 An adorable card, I love your design and the Kraft card and colours.......your Santa is so cute and lovely sentiment! !